Join us this week for our first ever live recorded episode! In an effort to release more episodes and reduce editing time, we are recording everything live with sound effects, music and clips all played live. Get our uncensored, uncut episodes in record time from now on! In this week's episode, we feature the Mission: Impossible franchise, in anticaption of the new film in the series, Mission: Impossible: Fallout coming to theaters July 27th. Steve will also give a breakdown of famous spy and espionage events throughout recent history and in pop culture. We also get into some Nerdy News of real life Neanderthal robots and a surprise Star Wars casting! Also enjoy some Radical Recommends, ridiculous Would You Rather, and Trailer Reviews of Mortal Engines and The Spy Who Dumped Me. Episode 90 - The Meteor Man and Movie Trailer Mania! 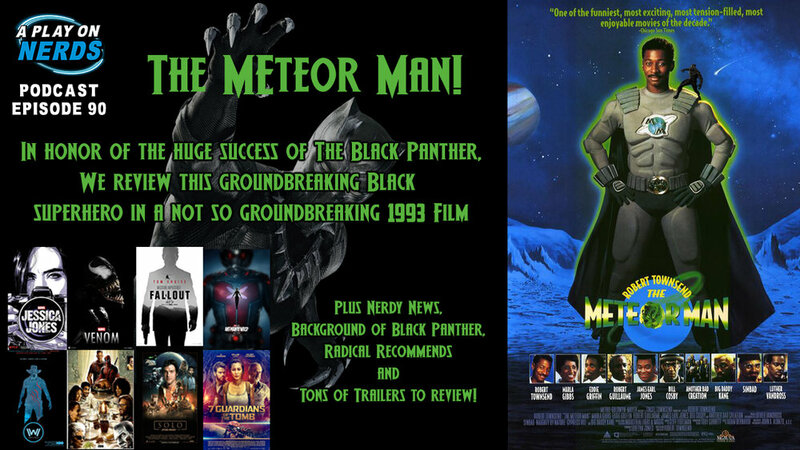 On today's episode of the podcast, we honor the great success of Marvel's Black Panther by going back to one of the first black superhero movies of the modern era: 1993's The Meteor Man! We review this film full of amazing stars and amazing missteps. We also cover a little background for Black Panther from the comics. See how it compares to the film! For Nerdy News, an AI has trouble with Valentine's Day, and cray-fish and ants are up to some amazing behaviors. We have some brief Radical Recommends and then delve into a slew of new trailers, including: Venom, Deadpool 2, Solo, Mission Impossible: Fallout, Westworld Season 2, Jessica Jones Season 2, Ant Man and the Wasp, and the guaranteed gem: 7 Guardians of the Tomb!